The jury is slated to bring the wrongful termination trial to a close this week. Marc Cherry, creator and executive producer of 'Desperate Housewives' — and most recently the subject of a lawsuit leveled by one-time cast member Nicolette Sheridan — at a panel in Pasadena in January. 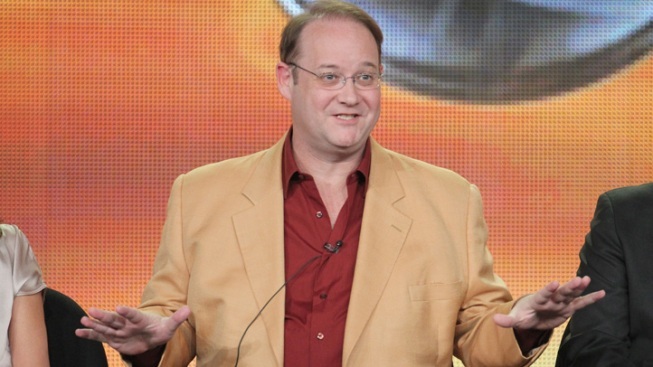 For eight seasons, Marc Cherry has woven conflict, mystery and death into the story lines of ABC's "Desperate Housewives," but soon 12 jurors will be the ones supplying suspense for the veteran television writer. Deliberations in actress Nicollette Sheridan's wrongful termination lawsuit begin this week, with the panel deciding whether they believe the actress was fired after complaining Cherry, the series' creator and show-runner, struck her on the set. He denies walloping her and contends her demise from the hit series was a long-planned plot point. Seven days of testimony have revealed conflicting stories that could easily have been scripted in the "Housewives" writers' room, providing a fascinating look behind the scenes of a hit prime-time series, complete with financial pressures, cast conflicts and secret meetings all on display. Jurors have watched montages and outtakes from the show, including the 48 — and counting — deaths aired since the series began in 2004. Much of the case has centered on the events in 2008, but moments after actor James Denton finished testifying, jurors heard an inadvertent spoiler about his character. Cherry has portrayed Sheridan as a polarizing figure on set, bickering with Teri Hatcher during the first season, not unlike the plot line at the time. He also testified that Eva Longoria and Felicity Huffman were "relieved" to learn in December 2008 that Sheridan's role as Edie Britt was being eliminated. Yet he praised Sheridan as an actress who performed so well in the show's pilot that he lobbied to make her a series regular and share the show's profits. Jurors won't hear directly from Longoria or Huffman after a judge deemed their testimony unnecessary. Sheridan attorney Mark Baute has noted that none of Cherry's allegations of bad behavior were ever documented, and Cherry himself maintains he opted to kill off Edie in the fifth season primarily for creative reasons. Baute has accused Cherry and others of conspiring to make it appear they made the decision before the on-set fight, when Cherry instead cut Sheridan's role only after ABC officials cleared him of wrongdoing. Her departure allowed the show to save much of the $200,000 per episode Sheridan would have earned if she survived into season six. Cherry and George Perkins, an executive producer, have said "Desperate Housewives" was under pressure at the time to cut costs. If she wins, Sheridan is seeking more than $6 million. "Desperate Housewives" was a ratings powerhouse in its early seasons, attracting more than 28 million viewers on some Sundays, but its audience has dwindled in recent years. It has won seven Emmy awards and as of last year earned more than $1.129 billion. Nearly 15 million viewers tuned in on the night in March 2009 when Edie's character escaped strangulation and survived a car crash, only to be electrocuted by a downed power line. Baute has said the scenario reflects Cherry's animosity toward Sheridan after she accused him of striking her. "The primary reason I killed off the character was because I thought it was the best thing for my show," Cherry said. The dispute between Sheridan and Cherry on Sept. 24, 2008, began as a discussion over a punch line. The actress was to briefly appear in a scene featuring her on-screen husband struggling to write a song with Denton's character. Edie suggests they write a love song and an initial script called for Sheridan to sing a few bars of The Beatles tune "She Loves You." Producers didn't want to pay royalties and so they cut the song. Sheridan felt the scene wasn't funny anymore without the song and pulled Cherry aside to discuss how to make it better. Under oath, Cherry said Sheridan appeared confused by his instructions to use physical comedy — a tickle or pinch to her stage husband after he jokes that "needy" rhymes with Edie. To demonstrate, Cherry said he tapped her on the head. Sheridan contends it was a "wallop" delivered by her frustrated boss. She left the set stunned and humiliated, but ultimately uninjured. Although there were several rewrites of the scene, scripts entered as evidence show none called for a character to be hit in the head. She reported the matter to her attorney and hugged a contrite Cherry in her trailer shortly after the incident. Sheridan finished filming, this time using the punch line, "Play that funky music, middle-aged white boys." She didn't sing it, so the show wouldn't have to pay license fees for riffing on the Wild Cherry hit. The next day she told Perkins that she wanted another apology, and this time Cherry should send flowers. He refused. The veteran writer testified he thought he merely offended the actress and since his original apology was sincere, a second one was unnecessary. "I thought, no, no, that's saying something more." While jurors will have to decide whether Cherry inappropriately touched Sheridan, the key issue is whether they believe her complaints led to her firing. Cherry, two former ABC executives and others have testified they held a secret meeting and approved killing Edie in May 2008. But two former writers testifying for the actress claim the decision wasn't made until December 2008. That month, an ABC investigation, launched after a National Enquirer story on the dustup, declared the incident as minor without interviewing either Cherry or Sheridan. They informed Sheridan's business attorney, Neil Meyer, of the results. "It felt like a whitewash," he told jurors. Whether a bouquet would have resolved the issue will never be known. "Desperate Housewives" is in its final season, and the trial is being discussed on the set, Denton said Thursday. He told jurors Edie's death wasn't surprising to him. "I can't say I was shocked, only because people get killed so often," he testified. Denton didn't reveal it, but a later witness did — his character dies in Sunday's episode. There's no good outcome from the case, Denton said, because someone will lose more than they already have. Edie's death ended Sheridan's multimillion dollar paydays, and Meyer told jurors he hasn't been able to find her acting work in two years. Baute asked Cherry how long the feelings of regret about his spat with Sheridan have lasted. "Well," he said, "going on three and a half years now."